I read this article and found it very interesting, thought it might be something for you. The article is called Varanasi’s Air 20 Times Above Safe Levels, Worse Than Delhi and is located at https://archive.indiaspend.com/cover-story/varanasis-air-20-times-above-safe-levels-worse-than-delhi-13160. On December 21, 2017, as Delhi’s air quality plunged to levels 19 times worse than World Health Organization (WHO) standards, the only consolation its people could take was that things were likely to be worse in other northern cities. On November 10, 2017, when national attention was focused on Delhi’s poisoned air, the holy city of Varanasi registered worse air quality–a PM 2.5 concentration of 491 micrograms per cubic meter or µg/m³ against Delhi’s 468 µg/m³, according to an IndiaSpend analysis of hourly averages for 24 hours. A similar situation exists across many cities of the Indo-Gangetic belt, but unlike Delhi, these cities do not even have adequate air-quality monitoring systems, let alone plans to fight the pollution. Varanasi has only one PM 2.5 monitoring station; Delhi has nearly 40. People in Varanasi were breathing air nearly 20 times worse than the WHO 24-hour average safe levels of 25 µg/m³ and eight times worse than the national ambient air quality 24-hour average standard of 60 µg/m³. Varanasi reported no more than seven days of good air quality over two months to December 10, 2017, (of 62 days monitored)–when the average levels of fine, toxic dust called PM 2.5 was below national air quality safe levels–according to an analysis of Central Pollution Control Board (CPCB) data from October 10, 2017 to November 10, 2017. There were no data available for 10 of the 62 days monitored. PM 2.5–emitted by burning coal, kerosene, petrol, diesel, biomass, cow dung and waste–is about 30 times finer than a human hair. These particles can be inhaled deep into the lungs, causing heart attacks, strokes, lung cancer and respiratory diseases. Their measurement is considered to be the best indicator of the level of health risks from air pollution, according to the WHO. Varanasi’s air has been bad for a few years now. In 2015, the north Indian cities of Varanasi and Allahabad had no days (of 227 and 263 monitored, respectively) with good air quality according to a December 2016 report, in which IndiaSpend was a collaborator. The report illustrated how public attention is largely focused on Delhi, while other north Indian cities report air-quality levels as bad or worse than the national capital. ‘Varanasi Chokes’, by the Centre for Environment and Energy Development (CEED), IndiaSpend and Care4Air, used the PM 2.5 national safe standard of 60 µg/m³, which is two-and-a-half times more relaxed than the WHO standard of 25 µg/m³. The air quality in Varanasi has worsened during the winter of 2017, with more than 60% of days with ‘very poor’ to ‘severe air quality’, said Aishwarya Sudhir, a Bangalore-based researcher and author of ‘Varanasi Chokes’. Air quality has six classifications: Good, Satisfactory, Moderately polluted, Poor, Very Poor, and Severe. These categories describe the Air Quality Index (AQI), a composite marker of various pollutants including PM 2.5 and its larger cousin PM 10. In 2016, the WHO’s list of 20 most polluted cities in the world featured 10 from India, with four of the worst–Allahabad, Kanpur, Firozabad and Lucknow–in Uttar Pradesh. While Varanasi is not on the WHO’s list, the Prime Minister’s parliamentary constituency is among India’s three most polluted cities, according to this 2015 CPCB bulletin. Most northern Indian cities across the Indo-Gangetic plain this winter have been recording ‘severe’ to ‘very poor’ air quality levels, said Sudhir. Unlike Delhi, there is little or no public awareness about the scale of the crisis and its corresponding health impacts. Cities like Varanasi do not have plans to control air pollution, she added. Delhi’s Graded Response Action is the only available default programme for all of northern India. The plan entails a number of actions to be taken as soon as the air quality plunges. The actions include stopping of garbage burning, banning trucks from entering the city, shutting down power plants, closing brick kilns and stone crushers. “Heavy industrial activity in the Indo-Gangetic belt has led to rapid degradation of air quality across North Indian region,” the 2016 report said. Changing wind patterns, especially during winter, carry power-plant emissions several hundred kilometers away, causing a spike in the regional pollution levels, the report said, quoting studies by Urban Emissions, a Delhi-based repository of information related to air pollution. The AQI in most north India cities is generated from less than three monitors, making the data unreliable and inconsistent. “Air pollution monitoring stations measuring PM 10 and PM 2.5 are limited to less than three for most cities across the Indo-Gangetic Plain,” said Sudhir. 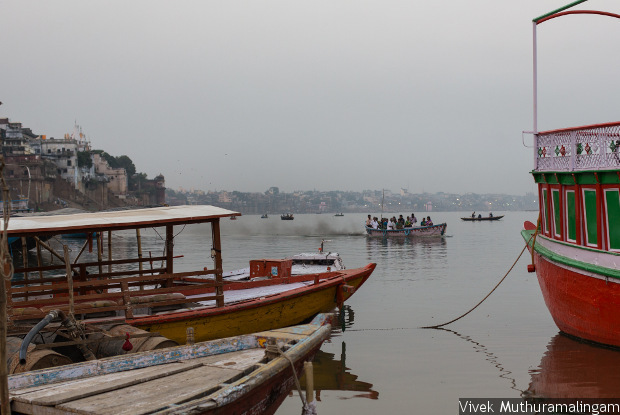 Not only does Varanasi lack adequate air quality monitoring stations, right-to-information data on the air-quality stations in Varanasi revealed significant gaps in PM 10 values, the report said. While the WHO asks countries to measure PM 2.5 as an air-pollution yardstick, some countries, such as India and China, continue to measure PM 10, which is less than 10 millionths of a metre in diameter–six times finer than human hair. PM 10 is a record of air pollution from non-combustion sources, such as road dust and dust storms.